The purpose of the Siouxland Conference shall be to promote and supervise the various forms of athletics and other school activities sponsored by the member schools; to instill in the minds of the high school students and the people of the several communities proper attitudes and ideals toward all activities; and to promote a high standard of conduct and the spirit of sportsmanship. The schools of the Siouxland Conference hope that you find this website to be a very useful tool. Click on any of the schools to the right to view their Activity Calendars. Click on Conference Calendar above to view the complete Calendar of all Siouxland Conference activities. Be sure to check out conference standings, results, all-conference teams and conference history located on the right side of this page. The Siouxland Conference was founded in 1952 and began play in the 1953-54 school year. Originally the league was made up of Rock Rpaids (became Central Lyon in 1961) from Lyon County, Orange City (became MOC in 1955 and MOC-Floyd Valley in 1991) and Hawarden (became West Sioux in 1955) and from Sioux County, and Akron and Le Mars Gehlen from Plymouth County and Augustana Academy of Canton South Dakota. 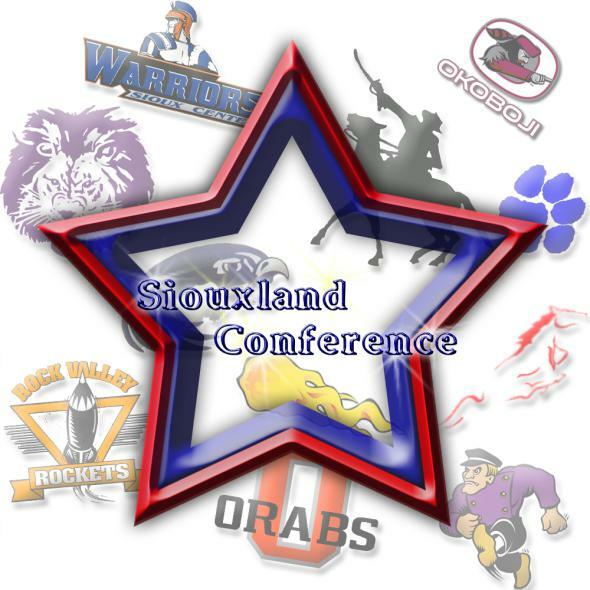 The Siouxland Conference originally promoted participation in four sports--football, basketball, track, and baseball. Rock Valley replaced Augustana Academy in 1960. George and West Lyon joined in 1961 and Gehlen left. In 1965 Central Lyon and West Sioux left to help form the Sioux Empire Conference. In 1967 the Sioux Empire conference disbanded and Central Lyon and Sioux Center joined the Siouxland. In 1974, West Sioux rejoined the conference. In 1975 Akron left for the Little Sioux Conference. The membership was stable until 1989 when George became George-Little Rock and Hartley-Melvin-Sanborn joined. In 1990 Sibley-Ocheyedan and Okoboji replaced West Sioux. In 2009 Sheldon replaced HMS. Check out more Siouxland Conference history by clicking on the history links at the right side of this page.